Compassionate Pain Management is donating its proceeds from marijuana joint sales to Red Cross relief efforts in Japan. Lakewood, Colorado (CNN) - When the earthquake hit Japan, Shaun Gindi knew he wanted to help. "I couldn't believe the devastation. I watched everything get wiped away. Their whole lives were gone," he said. "There was a moment where I started looking at ways to fly over there, ways to somehow get there to help out." Gindi knows nothing about search and rescue, so he soon abandoned that plan. But he is an expert in one area: medical marijuana. He runs two dispensaries in the Denver area called Compassionate Pain Management. 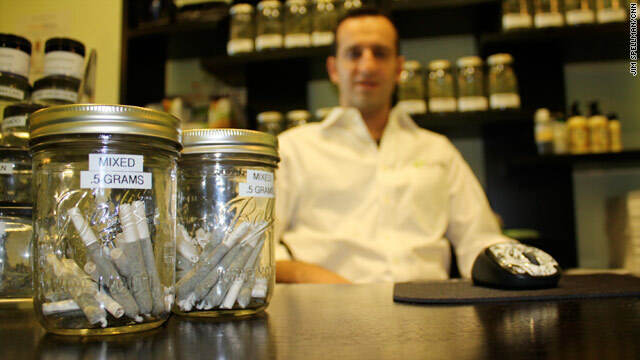 They legally sell marijuana to patients who have received a recommendation from a doctor. He floated the idea of raising money for Japan on his dispensary’s Facebook page and got a dozen "likes" right away. He knew immediately that he could use his dispensary to raise money. Thus was born "Joints for Japan." "What we're going to do is take all the revenue from the hand-rolled medicine, 100% of it, from this weekend and potentially for the next few weeks … and we're going to donate it to the Red Cross," Gindi said. "Hand-rolled medicine" is medical marijuana-speak for a joint, or a marijuana cigarette. They contain half of a gram of marijuana and are the most popular item in the store. At $5 each, Gindi says, they sell thousands a month. "We get a lot of people who just come in for these," Gindi said. The most difficult part of the endeavor has been coming up with the fundraiser's name. Gindi’s business is legal under Colorado law. He pays taxes and has 18 full-time employees. But the industry still struggles for respectability. With that in mind, Gindi rejected contenders such as "Bake for the Quake" and "Joint Relief." Gindi hopes his fundraising efforts help bring a bit more respectability to the medical marijuana industry. But ultimately, it is the people of Japan he truly hopes to help. "In Japan every day, the number of lives lost jumps up. Whatever we can do to help out, we’d like to do." More absolute bs from Whiplash.. if you have to credit weed for kindness and compassion, I really am sorry. Marijuana basically is useless and noone is missing anything by not smoking it. You must live in a utopia because the potheads I have always known are some of the most violent, insane and paranoid people around. They are generally complacent and low functioning retards, but thats about it. I just feel bad for the people who make weed into a lifestyle and never know a pure, sober day in their life. All drugs should be legal and available to enhance your life, but trying to defend and validate your usage by putting on this "enlightenment" bit is just bs. Even though admitting it just basically pulls the legs out from under your life, you're going to have to face the fact that potheads and drunks are on the same level. It's the same thing; escapism. Recreational use of any drug is for having fun and escaping reality just for a little while. But other than that, there really arent any real benefits. And hell, I am a user. Legalize shrooms and lsd as well, please.thank you. Who cares what shane says?? Put me down for 2 lbs of your finest dour x kush! I haven't graduated yet in my 21years of coolie High! Mj is one of the finest dicoveries ever made. Go after the crack, the meth, the heroin. That is your killer drugs. Leave the weed alone. I have never seen a violent pothead. And for a good night sleep, take a couple tokes and you'll sleep like a baby. TRY IT – YOU'LL LIKE IT.